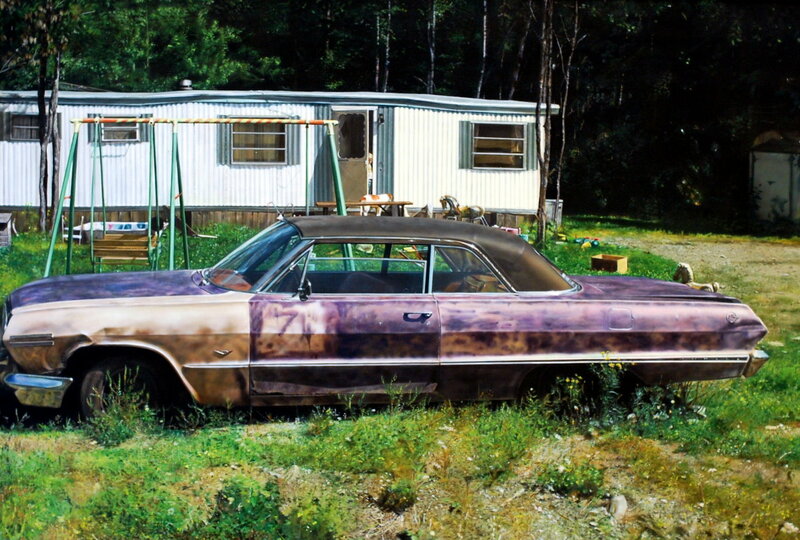 "White Chevy, Red Trailer" by the great John Salt, 1975, airbrushed acrylic on canvas. "Pioneer Pontiac", John Salt, 1971. 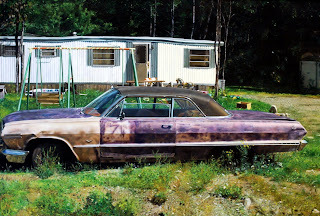 These paintings are ©John Salt. 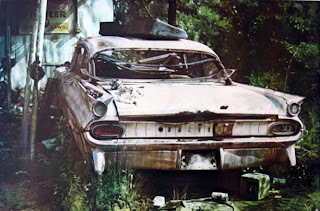 "Blue and White Ford Wagon in Field"
John Salt (1937-) is an English painter who hit it big in the early 1970s with his photo-realistic paintings of decaying automobiles rotting away in fields, trailer parks and urban streets. His paintings have always spoken to me, not only for their magnificent technical craft but also for the mundane and poetically lonesome vibe they send out, depicting once-gleaming possessions of pride and status, now pathetically discarded and left to rot among weeds and debris. As I gaze out the window on long road trips, I'll often think to myself, "there's a John Salt painting". 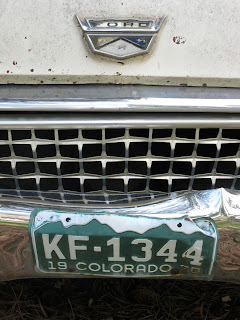 One of the most spectacular John Salt moments I've encountered happened at a campground in Colorado Springs, Colorado. 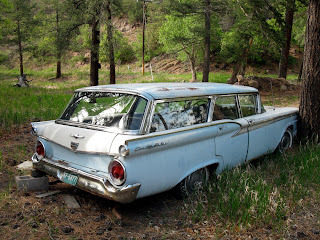 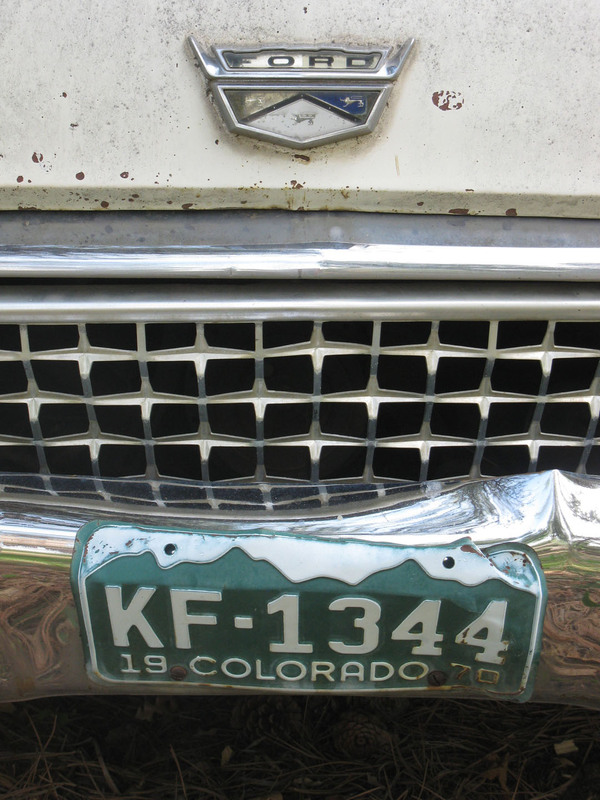 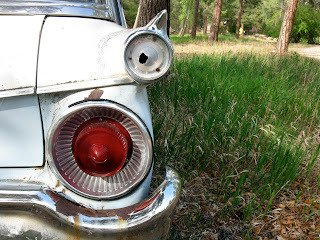 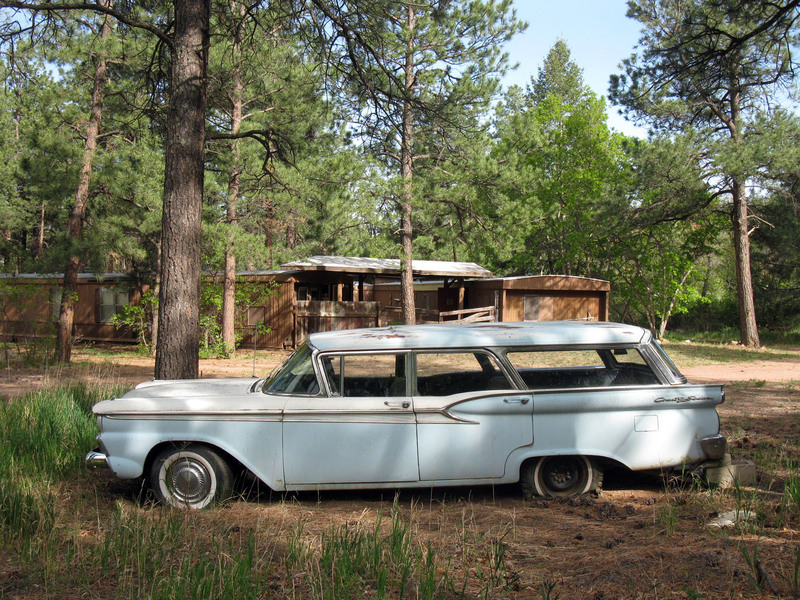 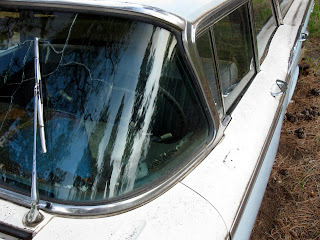 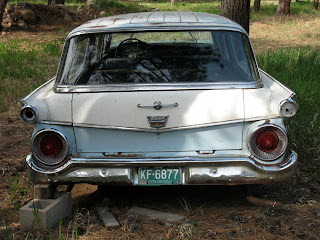 The wonderfully eccentric May Museum of Natural History in The Tropics, which we've blogged about before, is on the property, and off in the distance among the Colorado pines and tall grass sits a comatose 1959 Ford Country Sedan station wagon. 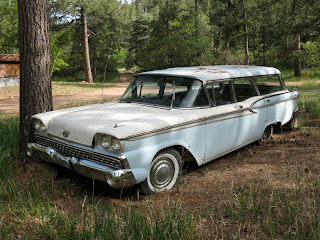 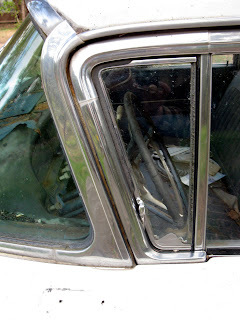 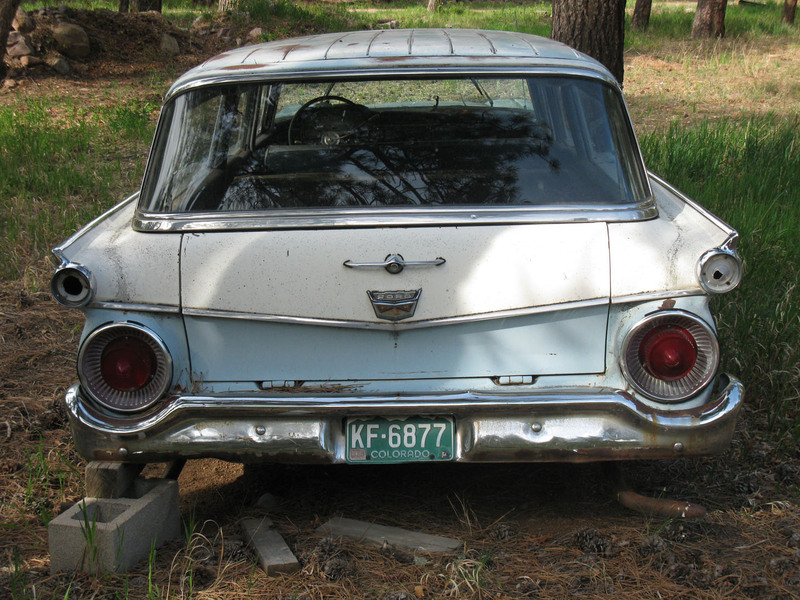 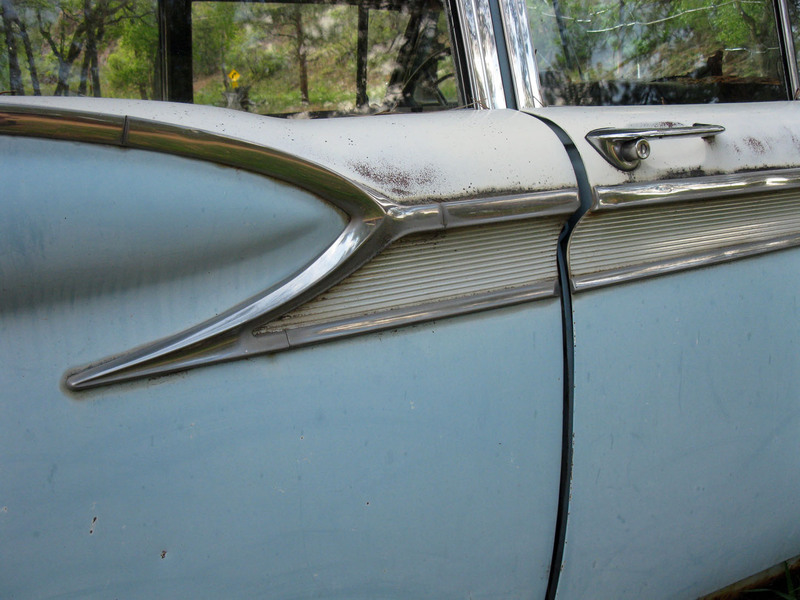 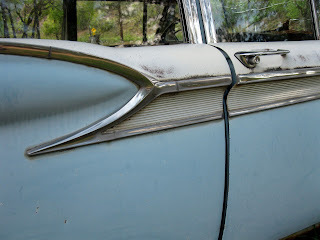 I actually remembered seeing this sad beauty on a previous road trip to the museum nine years earlier and was delighted to see that it was still resting in its same spot, full of melancholy ambiance. 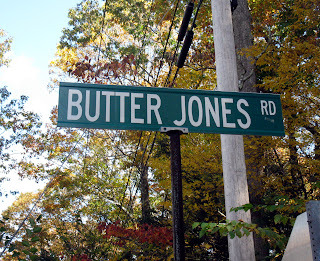 Bad Joke #1: Her Smith isn't very impressive Butter Jones is really nice. 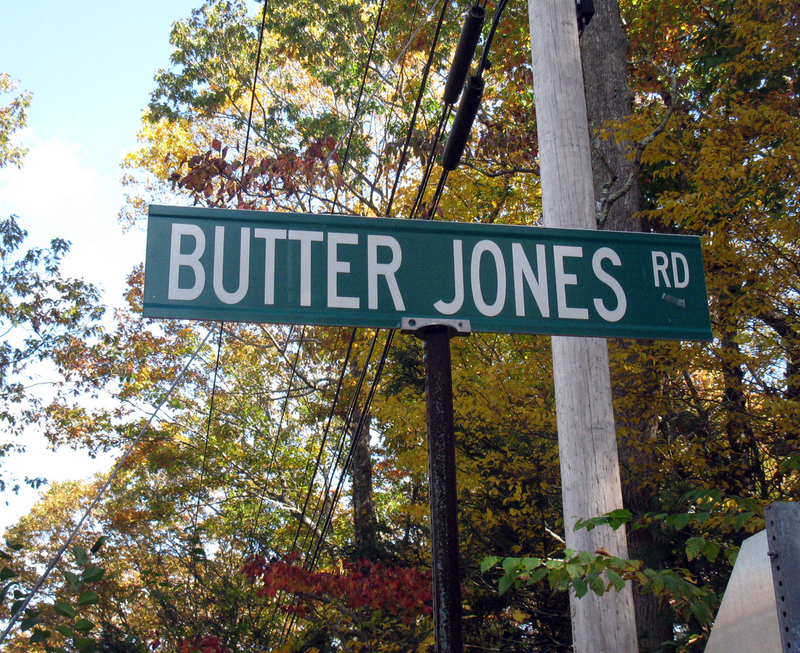 Bad Joke #2: On this street you'll find the corporate headquarters of Butter Jones and Gardens. The Chang and Eng Museum is conveniently located next to the Andy Griffith Museum in Mt. Airy. A musical was performed in 1997 and still tours. 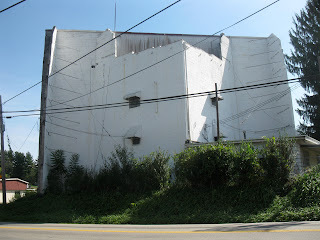 In 2000, a novel was written and actor Gary Oldman has acquired the film rights. 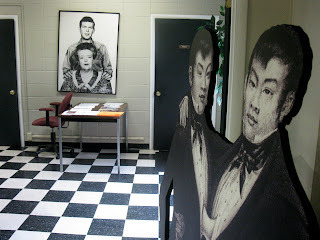 Andy and Aunt Bee aren't the only famous folks to reside in Mayberry. 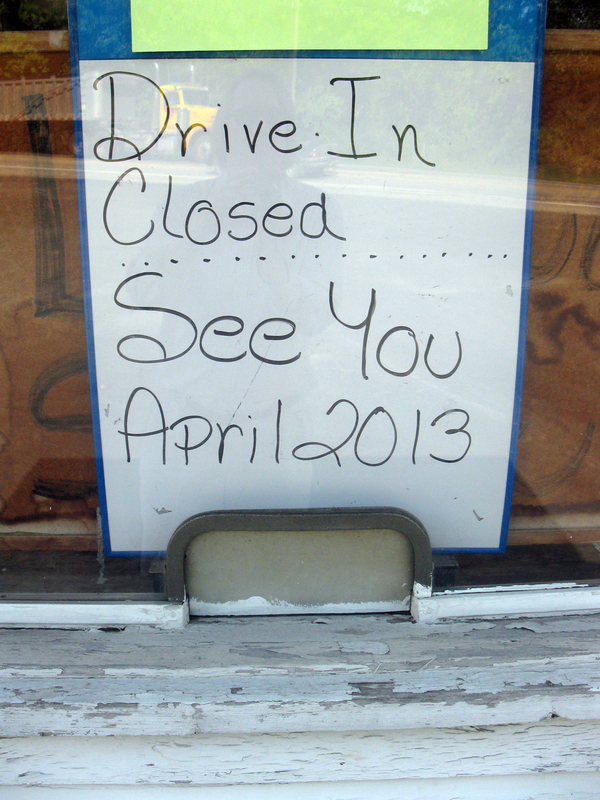 Y'all come back now, y'hear? 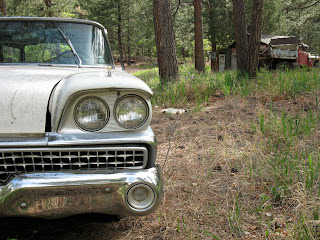 We've blogged a bit about the friendly little town of Mt. 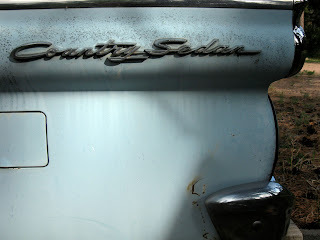 Airy, North Carolina, Andy Griffith's hometown and the inspiration for Mayberry. 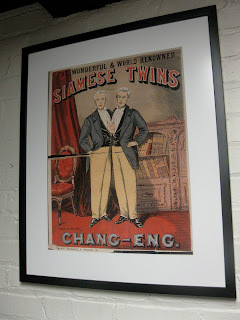 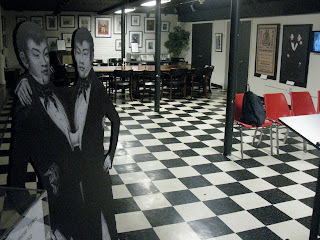 What we weren't expecting to see mixed in with Floyd's Barber Shop and Wally's Filling Station is a museum dedicated to Chang and Eng, the Chinese conjoined twin brothers for which the term "Siamese Twins" was coined. 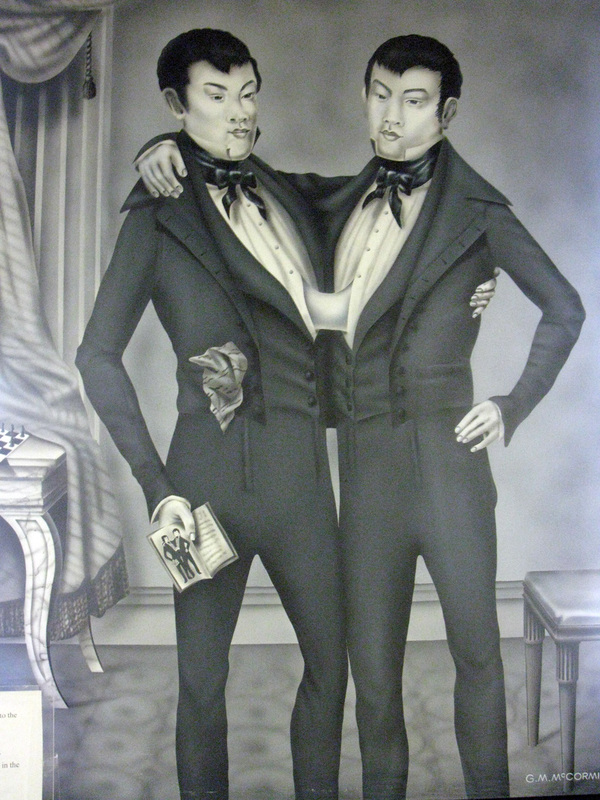 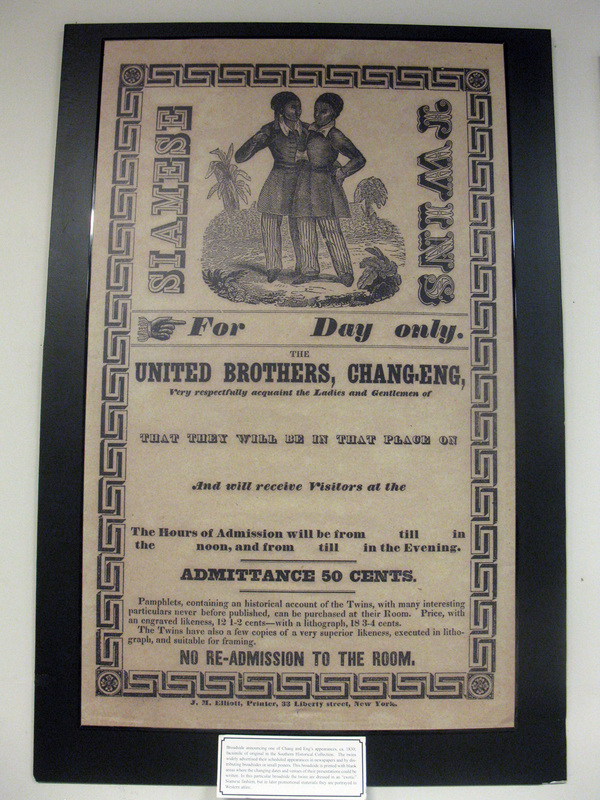 It seems the brothers, born in 1811 and joined at the sternum, were "discovered" by a British merchant in 1829 and were paid to travel as a curiosity around the world, eventually going into business for themselves. 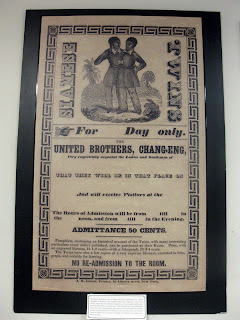 They settled in the Wilkesboro, North Carolina area in 1839 and were wealthy enough to buy a 110-acre plantation, own slaves and give up touring. 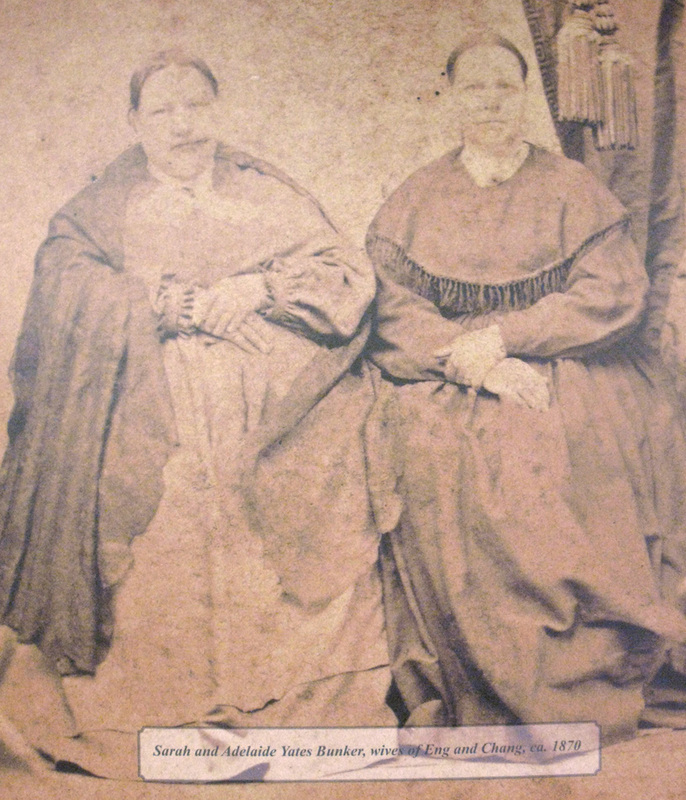 Wanting to fit in, they took the last name Bunker (though I'm guessing an American-sounding last name didn't prevent them from still kinda sticking out from the locals) and they married two sisters, Adelaide and Sarah Anne Yates. 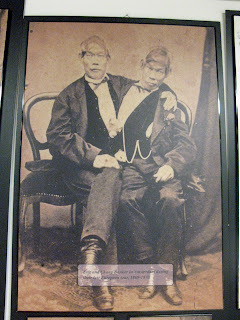 The couples shared a bed built for four and Chang and his wife had 10 children and Eng and his wife had 11. 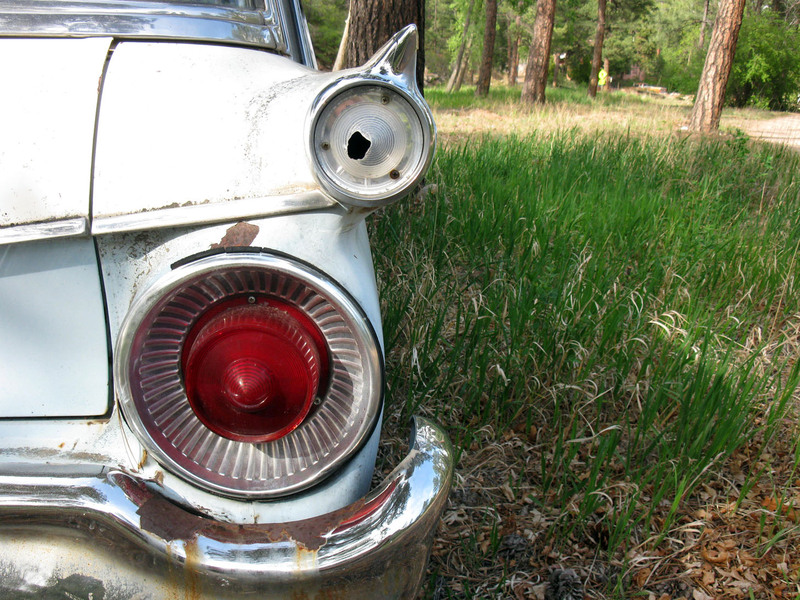 Boom-chicka-wow-wow. 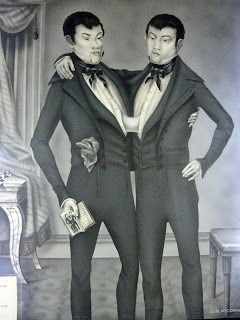 Eventually, the wives had a falling out and two separate households were set up, with the twins, er, splitting their time at each three days a week. 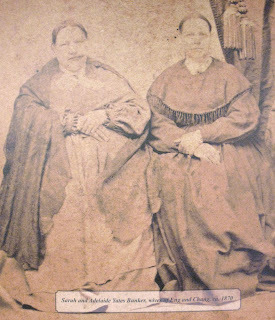 The twins died on the same day in 1874. 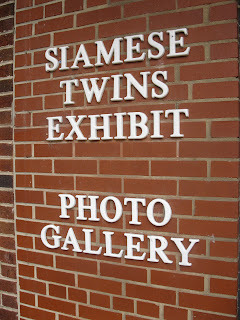 Today their descendants number around 1500 (!) 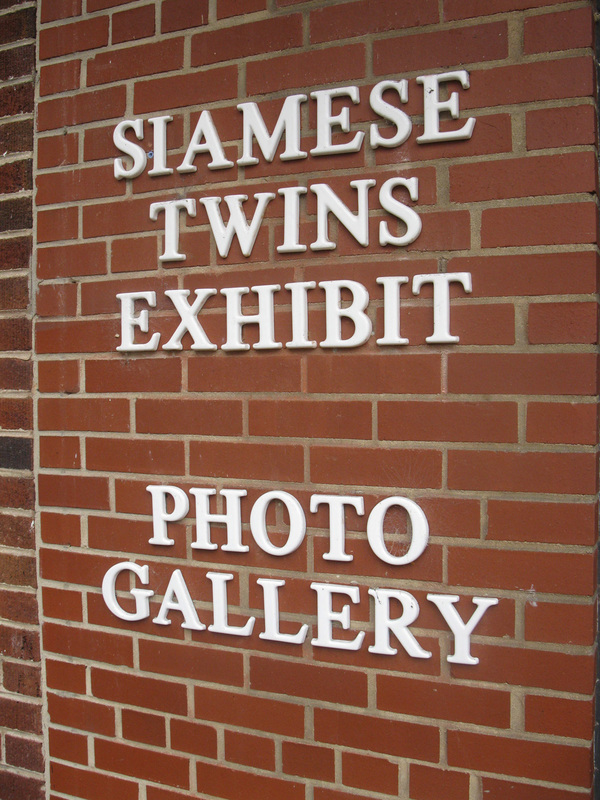 and they had a reunion in 2011 in Mt. Airy to celebrate Chang and Eng's 200th birthday. 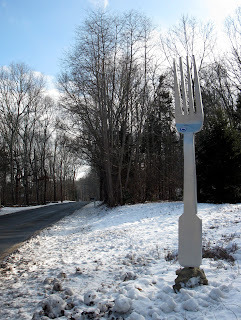 It's too bad Andy never used this part of Mt. 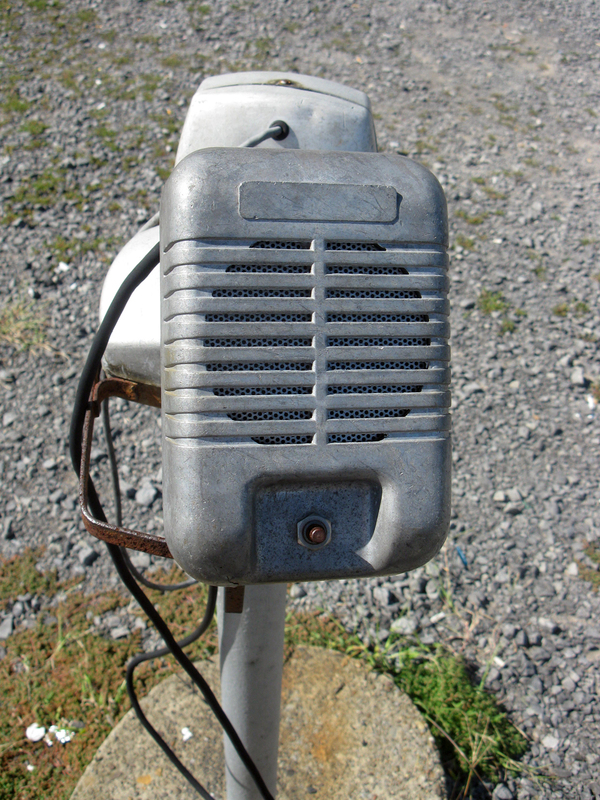 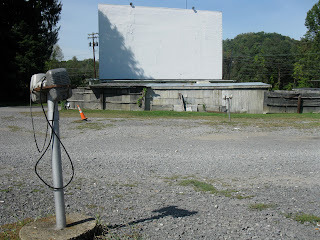 Airy's history for The Andy Griffith Show. 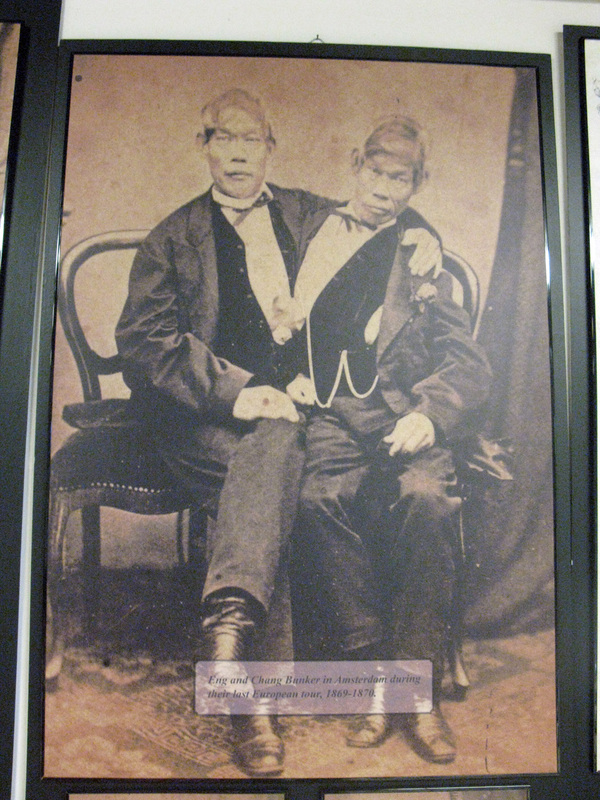 Then again, maybe Gomer and Goober recast as Siamese twins would have been a bit too David Lynch for Mayberry. 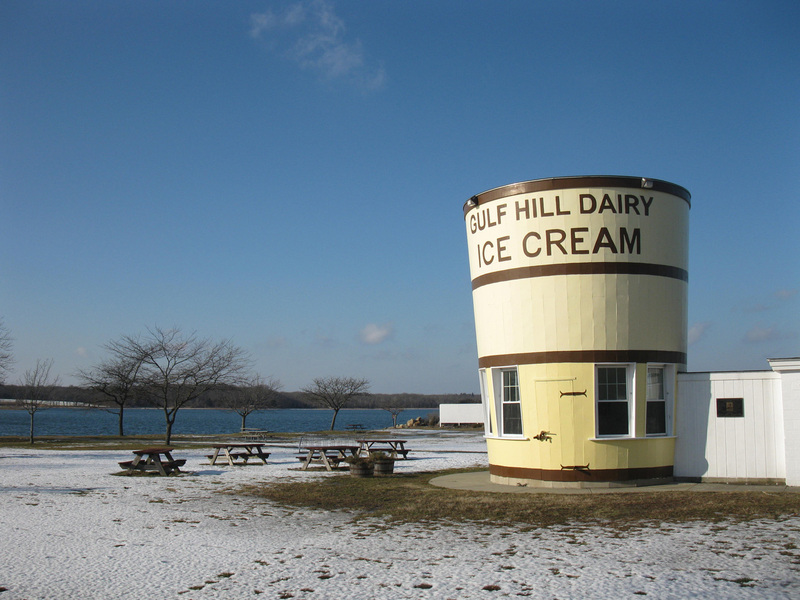 There's a 15-or-so-mile stretch in southeastern Massachusetts that could be called the epicenter of dairy-related mimetic architecture. 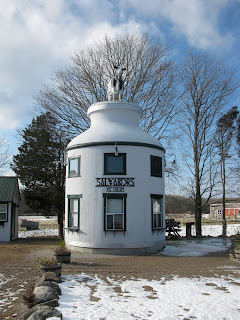 Salvador's, in South Dartmouth, is an ice cream parlor that's in the shape of a 30-foot milk can that dates back to 1936. It's been spectacularly renovated in recent years, complete with life-sized cow sculpture atop its roof. 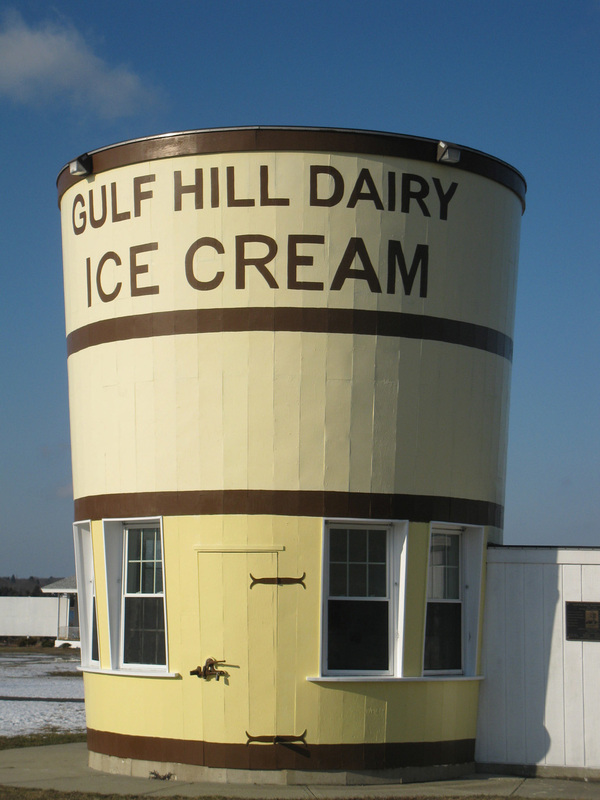 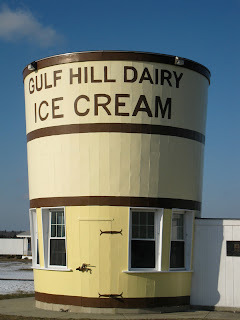 A mere two miles away in Dartmouth is the 20-foot Gulf Hill Dairy Ice Cream bucket. 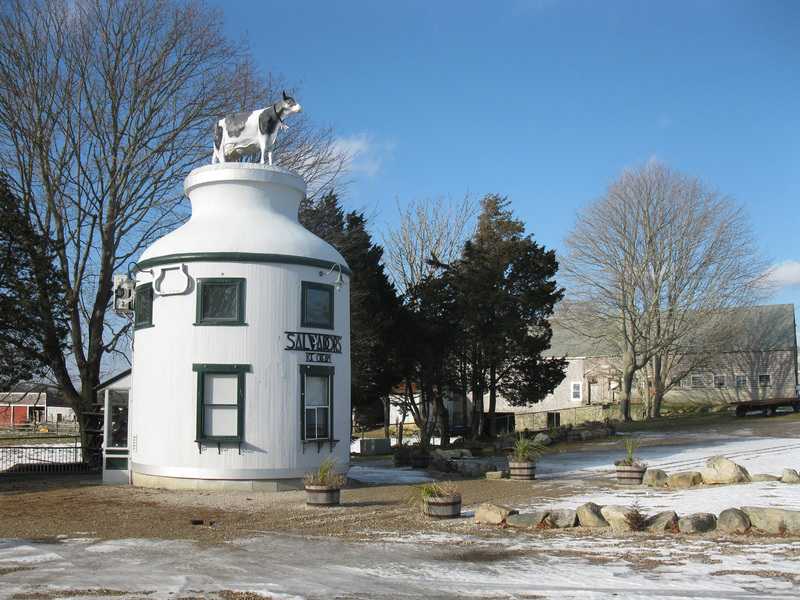 It's from 1929 and was lovingly restored and reopened in 2008 as Oxford Creamery At The Bucket after being shuttered for more than 20 years. It was moved from its original location to a lovely waterfront spot in Apponagansett Park, where they serve food, beverages and ice cream seasonally. 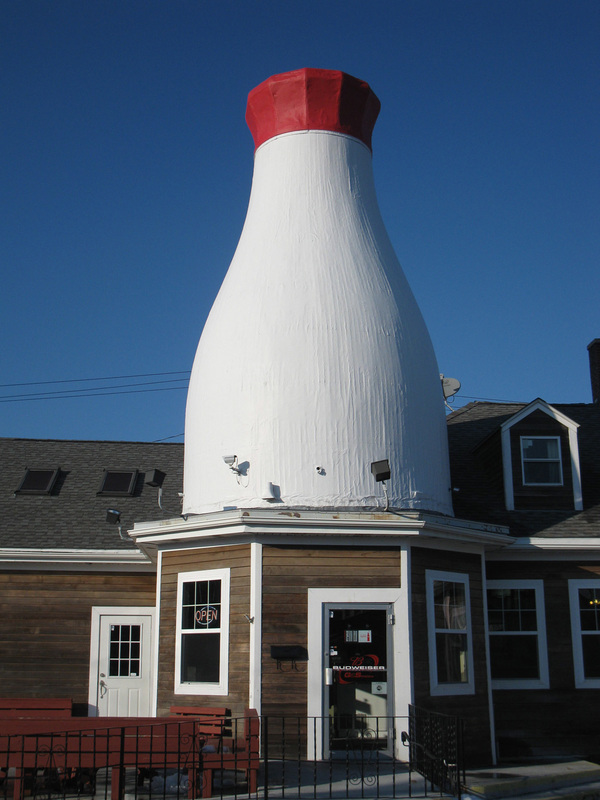 Thirteen miles north in New Bedford sits G & S Pizza. They took over a beloved local landmark in 2006 that was originally Frate's Dairy, an ice cream parlor from the 1930s with a 52-foot milk bottle, and have been serving ice cream, pizza and other fine edibles ever since. The bottle is in superior condition, and was white and gleaming against the blue sky when we were there recently. 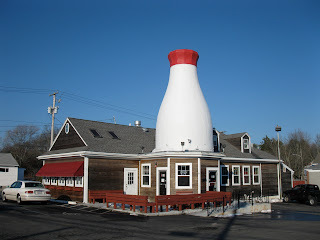 We've also had the pleasure of visiting The Milk Bottle Restaurant, 24 miles away in Raynham, Mass., which was the sister milk building that Frate's built back in the '30s. 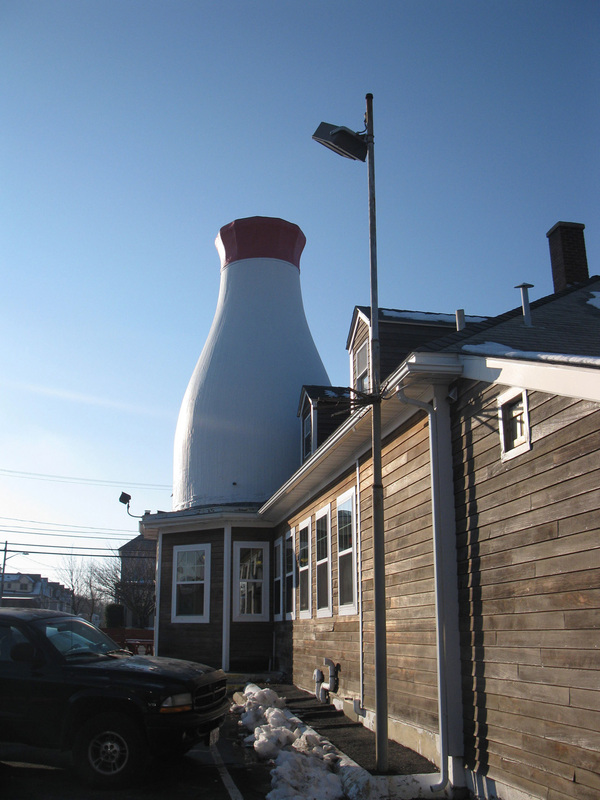 And we hear there's another big milk bottle in Boston, but we'll have to save that for another trip. 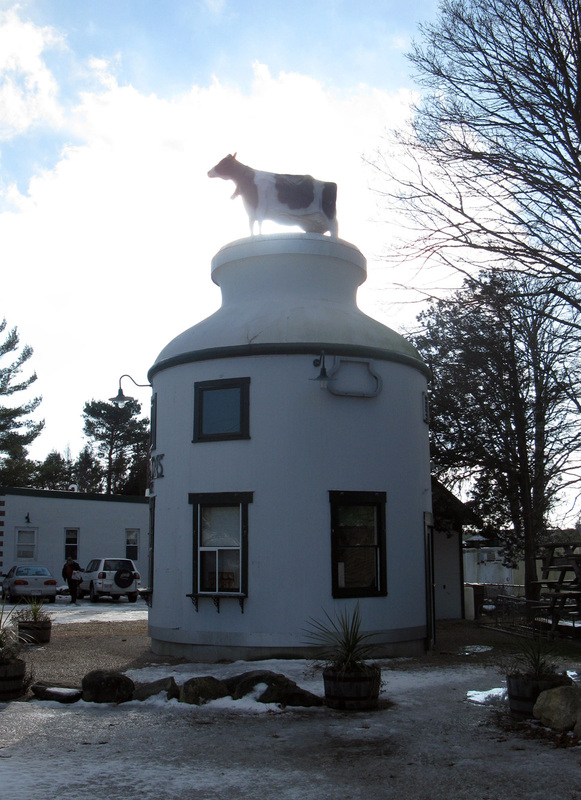 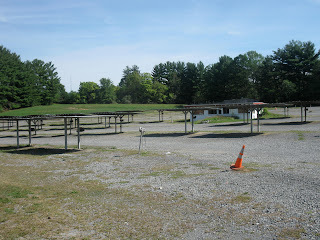 So be on the lookout for these special places and join in the commerad-dairy. 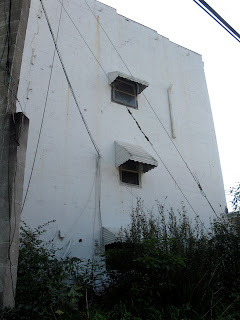 You wouldn't want them to slip pastyoureyes. 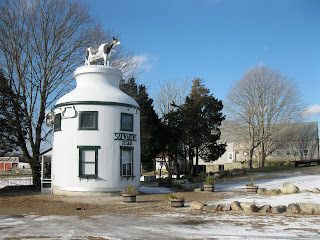 I won't udder another word. 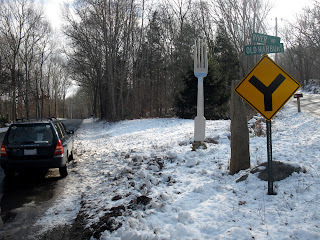 The great Yogi Berra was really on to something when he said "When you come to a fork in the road, take it", at least for us eccentric roadside attraction fans. We live by those words so much, in fact, we put them on our masthead. 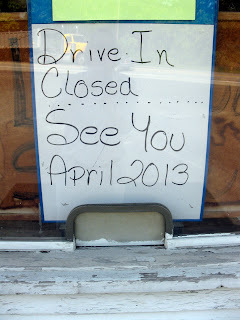 Some folks have taken to putting up some literal interpretations of these sage words. 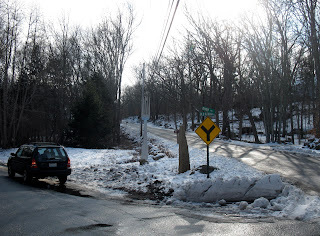 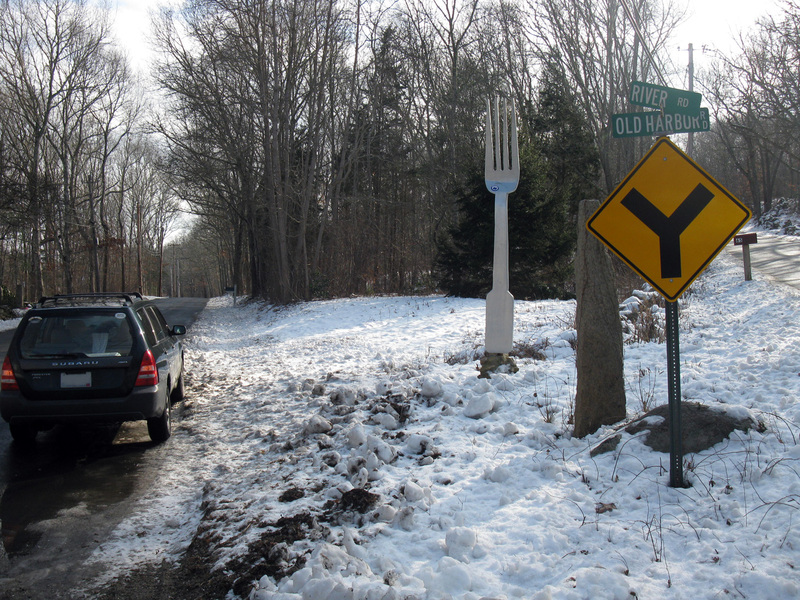 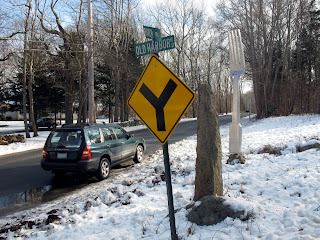 We came across an awesome example in Rock City, New York a while back and have now been delighted a second time with another fine example of roadside whimsy at the intersection of Old Harbor and River Roads in Westport, Massachusetts. 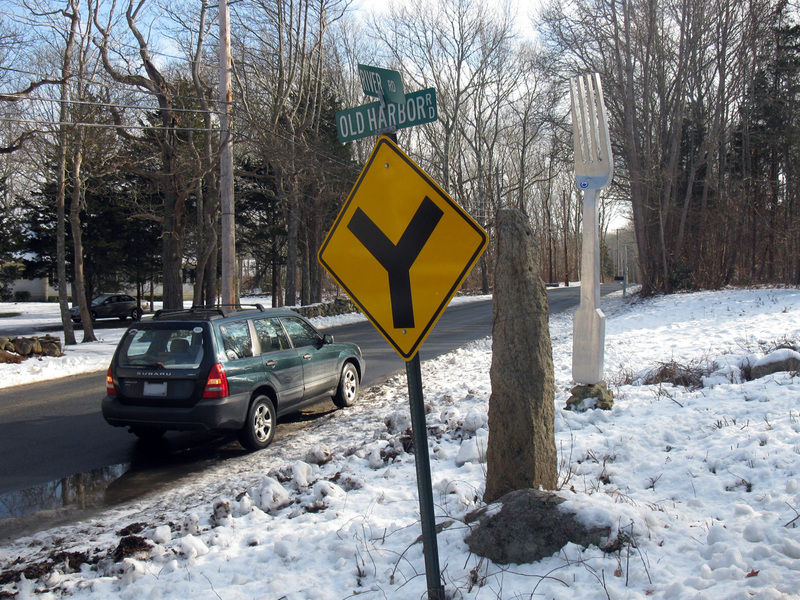 This one is especially awesome because it's in an incredibly lovely neighborhood, with expensive homes overlooking a marshy waterfront sound. 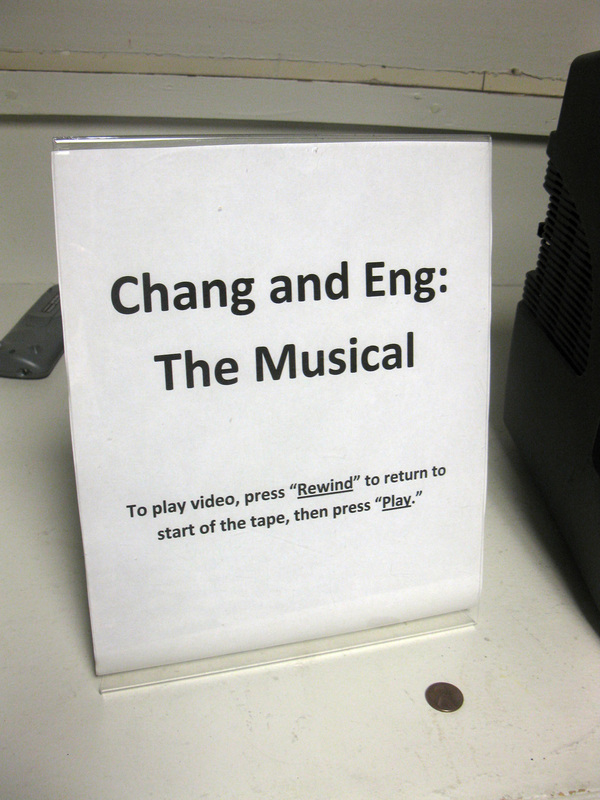 Nice to see that well-moneyed folks appreciate a terrible pun just as much as us peasants. 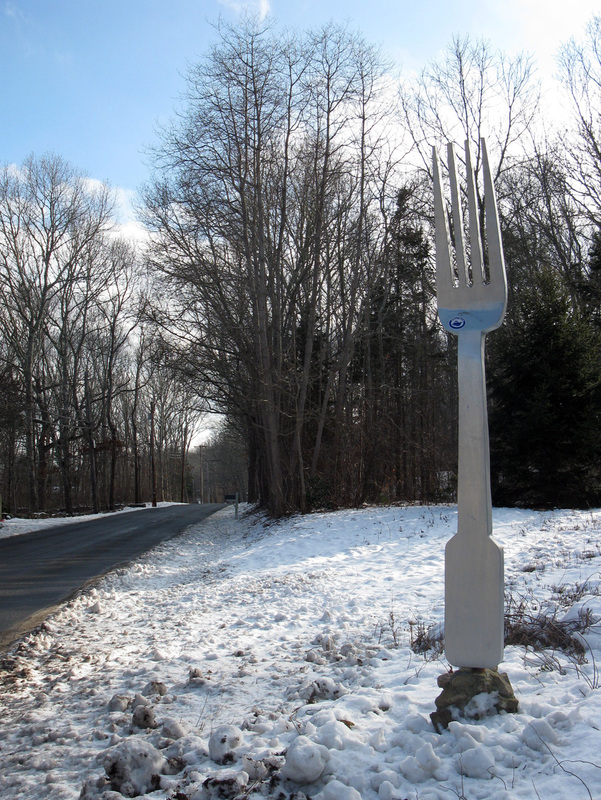 Thanks, Westport, and may the forks be with you. 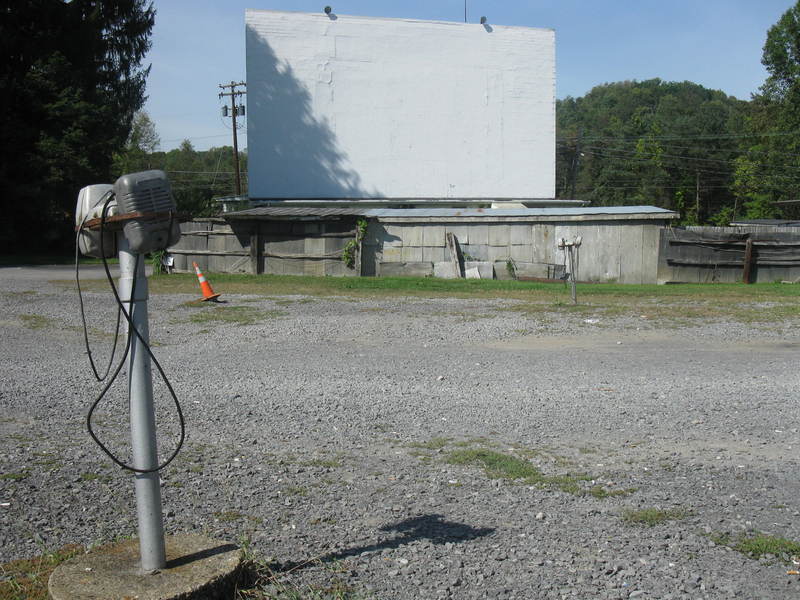 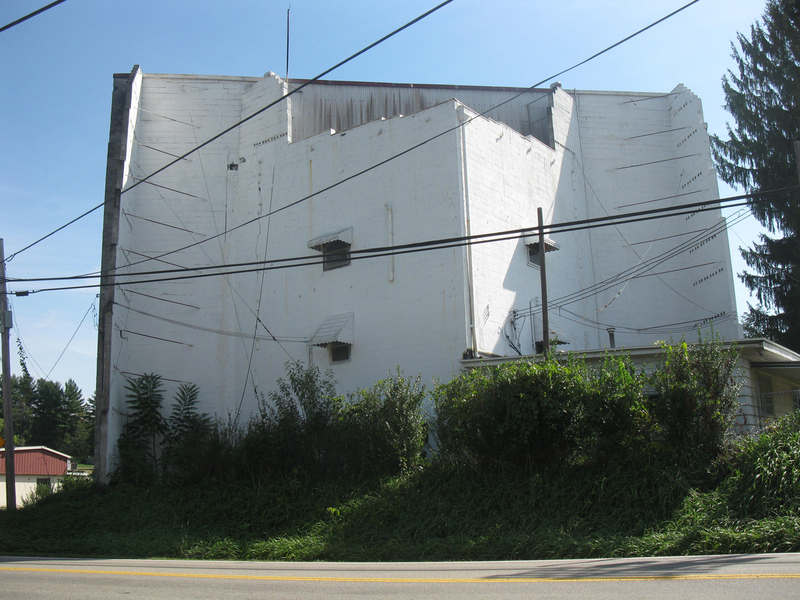 We're big fans of drive-in theaters, especially the slightly eccentric ones, and there's a hum-dinger in the northwestern West Virginia town of Shinnston. Not only has the Sunset Drive-In on Highway 19 been owned and run by the same family, the Ellises, since 1955, there's a home built right into the screen. 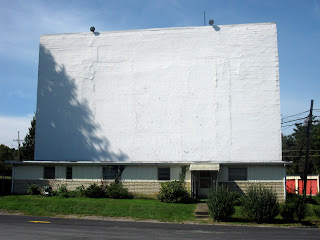 Imagine that...while folks are having a night out watching the latest Judd Apatow opus, eating delicious snack bar hot dogs and snow cones in the comfort of their roadsters and coupes, someone is inside the screen watching "The Voice", eating a baloney sandwich, paying the gas bill or soaking their feet. It's a colossal structure perched just inches away from the highway, three stories tall with festively-awninged windows and a mailbox out front. 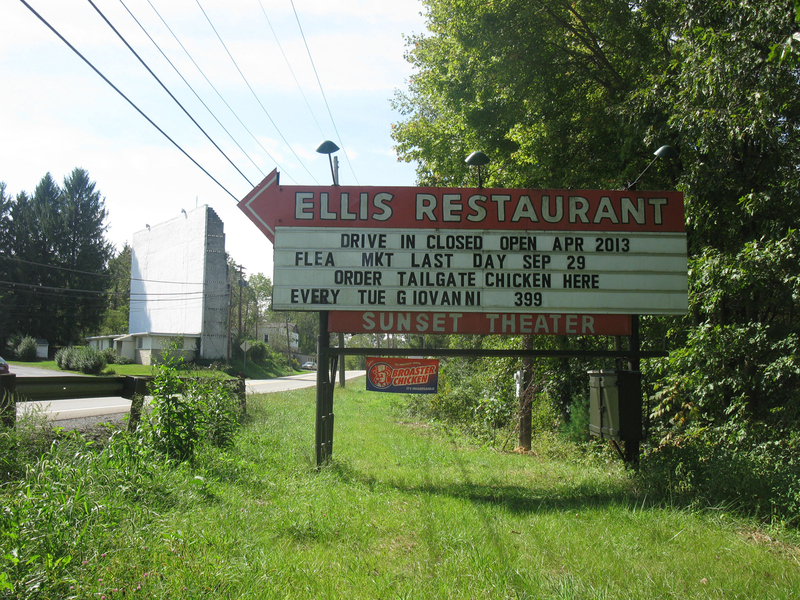 The Sunset Ellis restaurant, open year round, is also on the property offering, among its many fine choices, broasted chicken and an all-you-can-eat pasta special for $5.99 on Wednesdays. 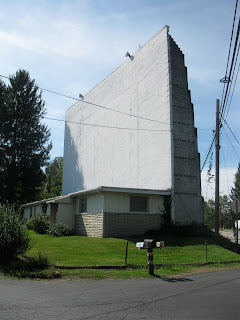 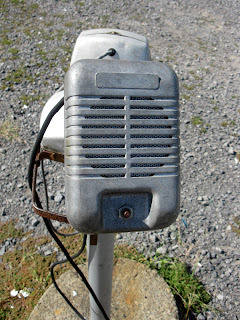 It's always a delight to encounter a retro-tastic place such as this. 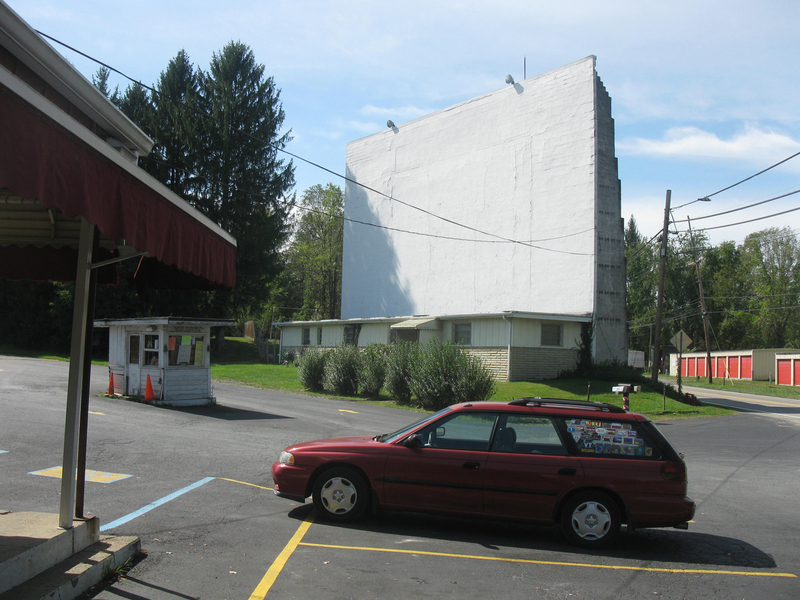 With so many drive-ins abandoned or worse, it's a thrill to see a living breathing one still operating as if Eisenhower were president.